Who can be treated with traditional Chinese medicine? Why does cupping therapy produce a slight bruise? What is Chinese therapeutic massage (Tuina)? Are there any side effects in herbal medicine? Is there a consultation during the first session? What kind of problems or illnesses can be treated? Should I continue with my prescribed medication while undergoing a course of Chinese herbal medicine or acupuncture treatment? Are there endangered species in Chinese herbal medicines? Why choose Dr Panda (Liu's Chinese Medical Centre)? 1. What is traditional Chinese medicine? Traditional Chinese medicine treats health problems using natural remedies including Chinese herbal medicine, acupuncture, moxibustion, therapeutic massage (Tuina), cupping, Taiji and more. Treatments are focused on improving and restoring the flows of qi (energy) and blood in the body. Traditional Chinese medicine aims to treat the root of the issue rather than just treating the symptoms. 2.	Who can be treated with traditional Chinese medicine? Almost anyone, but we advise that pregnant women do not take any herbal medicine. 3. How does acupuncture work? Acupuncture is used to improve blood circulation by inserting sterile fine needles at different points on the body. By inserting these needles into the points, you are given pain relief and your overall health can be improved; restoring your body to a natural balance. No, not usually. Some patients feel a dull ache at the point where the needle has been inserted, but this is generally seen as a good therapeutic sign showing that the treatment has worked. The needles that are used during acupuncture are so fine that many patients are pleasantly surprised at how relaxing and therapeutic the treatment is. Whether or not the treatment hurts varies depending on each individual; some say that it doesn't hurt at all while others find that it hurts a bit. 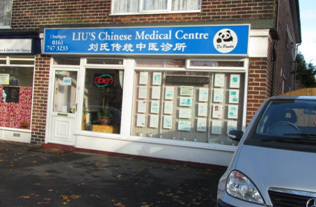 We have practised acupuncture and herbal medicine for thirty years at university hospitals in China and at Liu's Chinese Medical Centre (Dr Panda) in Urmston, Manchester. We have completed millions of acupuncture sessions; we can say it is safe and effective, but we don't suggest that you receive acupuncture when you are hungry in order to avoid fainting. Moxibustion means a Chinese herb called moxa is burnt to produce heat stimulation, leading to improved blood flow and a strengthened immune system. Moxibustion treatment is used to treat medical problems including arthritis, tennis elbow, IBS and much more. 7. Why does cupping therapy produce a slight bruise? During cupping therapy, a glass jar is sucked onto the skin in order to improve blood flow. It is better if a slight bruise is left on the skin; the mark indicates improved local blood circulation and longer lasting results. The mark will disappear in a few days. 8. What is Chinese therapeutic massage (Tuina)? Tuina means therapeutic massage in China. It is stronger and deeper than normal massage. Tuina practitioners use herbal oils according to your specific problem during tuina. Tuina is also used to relieve stress and aid relaxation. 9. What is Chinese herbal medicine? Chinese herbal medicine uses different plants to improve health and treat illnesses. Different parts of the plants are used including roots, barks, flowers, seeds, fruits, leaves, and branches. Herbs are used in three different forms: decocting pieces, concentrated granules and our patent formulae. Chinese herbs can be used to treat a range of health problems and illnesses. 10. Are there any side effects in herbal medicine? There are very few side effects. Chinese herbal medicine is actually safer than conventional western medicine and has proved quite successful in relieving the side effects of chemotherapy. 11. Is there a consultation during the first session? Yes. You will be given a thorough consultation through inspection (looking), auscultation (listening), inquiring (asking) and palpation (touching). Your Chinese doctor will also feel your pulse and inspect your tongue in order to decide on the best course of treatment for you. 12. How will I feel after the treatment? People usually feel relaxed and calm after their treatment. Our aim is to make you feel better or improved after just one session with us. Occasionally patients can feel tired or drowsy for a few hours if the treatment has been particularly strong. 13. What kind of problems or illnesses do you treat? Head & Neck: Migraine, Trigeminal neuralgia, Bell's palsy, Stress, Anxiety, Depression, Myalgic encephalomyelitis (ME), High blood pressure, Headaches, Vertigo, Tinnitus, Insomnia, Stroke, Sinusitis, Acne, Hair loss, Sore throat, Cervical spondylosis, Lose weight, Stop smoking. Arms & Hands: Frozen shoulder, Tennis elbow, Psoriasis, Rheumatoid arthritis, Carpel tunnel syndrome, Trigger finger. Trunk (Back): Disc Herniation (slipped disc), Lumbar muscular strain, Acute lumbar sprain, Third lumbar transverse process syndrome, Osteoarthritis, Back pain. Trunk (Front): Infertility, Menopausal syndrome, Dysmenorrhea (period pain), Prostatitis, Prostatauxe, Impotence, Erectile Dysfunction (ED), Chronic bronchitis, Palpitation, Heartburn, Peptic ulcer, Gastritis, Indigestion, Diarrhoea, Constipation, IBS. Legs & Feet: Sciatica, Piriformis syndrome, Hip pain, Groin injuries, Pulled hamstring, Knee osteoarthritis, Knee ligament injuries, Leg edema, Ankle swollen, Gout, Heel pain (plantar fascitis), Eczema, Tinea (ringworm), Sports injuries. 14. How many sessions will I need? The amount of sessions that you will need depends on what problems you are experiencing & how long you have had them for. We suggest the sessions are done as early as possible. We will recommend a few sessions or a couple of courses of treatment depending on how you are responding to it. 15. Should I continue with my prescribed medication while undergoing a course of Chinese herbal medicine or acupuncture treatment? Yes. Many people seek the help of an acupuncturist or herbalist because they are dissatisfied with the results that they are getting from their drug treatment, whether this is because it does not seem to be working or because the side effects are unpleasant. We recommend that you do not stop taking any medication without professional advice. 16. Are Chinese Herbs natural? Yes. Both Chinese herbs and acupuncture are natural therapies. 17. Are there endangered species used in Chinese herbal medicines? 18. 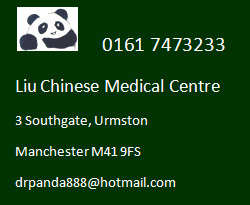 Why choose Dr Panda (Liu's Chinese Medical Centre) in Urmston, Manchester? There are many reasons to choose Dr Panda (Liu's Chinese Medical Centre). We have years of experience; Mr Zexin Guo (Dr John) was a medical doctor for decades in China before starting his centre in Manchester. He also wrote the "Acupuncture Techniques" medical textbook, which is used by medical students throughout China. He has written and published over thirty papers on the journals of traditional Chinese medicine, acupuncture and rehabilitation. Our centre is a member of the Association of Traditional Chinese Medicine and Acupuncture UK, and of British Acupuncture Council. Mr Guo is also a Fellow Member of the Association of Traditional Chinese Medicine and Acupuncture UK. We have treated over 30,000 different cases in both the UK and China, so you can rest assured that we can help and have the expertise that you need. The clinic bills are covered with almost all of private insurance company in the UK. We have a private car park in front of shop. Copyright © 2019 Dr Panda. All rights reserved.